Although the internet provides a lot of guidance on most things, it doesn't even come close to what you can learn from an eminent writer on antique clocks. Occasionally I acquire a second copy just for interest, perhaps a signed copy for example or an earlier edition, and the ones listed here are surplus duplicates in my library. These are almost all out of print, "working" books, not collectors items but condition is generally good though some might have my personal libris emboss stamp. CARRIAGE CLOCKS by Charles ALLIX is the finest book ever written on this topic and the reference bible for many dealers and repairers. This is a 1974 first edition published by the Antique Collectors' Club. There are 484 glossy pages on history, design, origins, and makers' marks, lavishly illustrated mostly in monochrome with over 500 illustrations. A tightly bound hardback in good condition with slight tear to the dust cover. £60 - plus £10 UK postage. 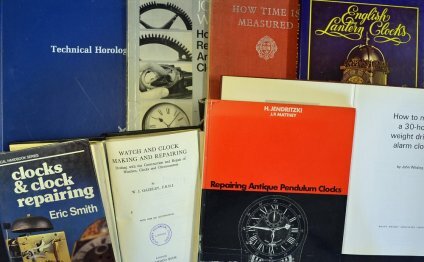 THE CLOCK REPAIRER'S HANDBOOK by Lawrie PENMAN is one of the very best of the more modern clock repair books. Written by someone who earns a living from repairing clocks rather than writing about them. He describes it as it is with great confidence and practicality, in the John Wilding vein. Well illustrated with 300 clear line-drawings and written in an easy to read fashion. This is a 1998 reprint of the enlarged 1992 edition signed by the author and published by David & Charles. Condition as new. £15 plus £7 UK postage. COUNTRY CLOCKS & THEIR LONDON ORIGINS by Brian LOOMES is a classic, must read narrative book for any owner of a Longcase clock who is interested in learning more about their origins, changing styles, dating and detecting fakes. 192 pages with monochrome illustrations. A tightly bound 1976 First Edition hardback signed by the author and in great condition with fly sheet. £30 plus £6.50 UK postage. WATCHMAKERS & CLOCKMAKERS OF THE WORLD (Vol 2) by Brian LOOMES is an absolutely indispensable directory for anyone who wants to date a clockmaker, having 300 pages and 35, 000 entries in alphabetical order. This is a 2000 reprint of the 1989 second edition hardback published by NAG. Condition as new. £16 plus £6 UK postage. LOOKING AFTER YOUR BAROMETER by R E ROSE is a great, no-nonsense 32 page booklet for owners and dealers explaining how to transport, set up, adjust and care for barometers and barographs. Another fine writer of plain English, Ron Rose also offers guidance on some small repairs that a competent owner can undertake. I have several unused copies - I recently bought a bundle of new old stock to enclose one with each barometer I sell. Joseph Knibb (1640–1711) was an English clockmaker.